The pre-spliced furling line can be shortened if required and respliced using the RFSPLICE-1 splicing needle. (see support Tab for details). Ronstan’s Continuous Line Furlers put great performance and reliability within the reach of cruising and racing sailors alike. The range matches drum diameters to load ratings providing the optimum balance between speed and ease of furling. Drums incorporate a machined groove profile and cross-hole geometry to grip the furling line securely. When deploying the sail the continuous furling line self-ejects from the grip zone, remaining stationary for smoother, safer operation with minimum rope wear. A PTFE perimeter strip ensures the unloaded furling line can’t fall from the drum or become snagged. Top-down furling provides a new level of simplicity, safety and speed for handling of soft luff sails such as asymmetric spinnakers and gennakers. Cruisers can now store, deploy and retrieve these sails as simply as they would a furling headsail from the safety and convenience of the cockpit. Racers too can benefit from the characteristics of top-down to allow superfast retrieval of code zeros by prewinding the torsion rope and firing the sheet when ready. Ronstan furlers are available with top-down adapters or in dedicated top-down models with practical accessories such as top swivel lashing pins to provide the perfect solution. Furlers and top swivels feature a factory sealed, maintenance free bearing. Roller bearing sets run on hardened races for smooth high load performance. The continuous furling line is easily fitted and removed from the furler, so it can be left on deck when the sail and furler are stowed below. Furlers and top swivels have retained clevis pins and top swivels have a snag-free low profile shackle pin head. Attachment options include quick release pins, high resistance shackles, snap shackles, fairleads and torsion rope thimbles. The furling line guide can be adjusted to suit either 0˚ or 90˚ attachment, as required to match the take-off alignment and deck layout. A compact rotation stop can be added to compatible models of furlers to ensure inadvertent unfurling of the sail doesn’t occur. 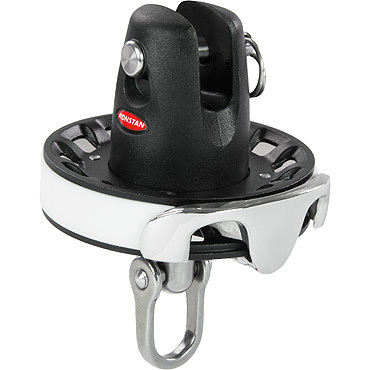 The rotation stop is simply installed on the underside of the furler and can be locked out when in use, or in when the sail is furled or stowed.